Are domestic cats backyard superpredators? Cats are the most popular pets in the world. More than a third of American households have feline family members, and more than 600 million cats live among people worldwide. But a recent report has catapulted felines into the headlines by suggesting their cute and fluffy exteriors belie a ruthless hidden nature. Are domestic cats actually cold-blooded killers that pose a serious threat to biodiversity? Cats were recently named one of the top 100 worst invasive species in the world, and have been implicated in 33 modern bird, mammal, and reptile extinctions. Now, a new study published in Nature Communications suggests the kill rates of cats in the U.S. are two to four times higher than previous estimates. This would make the domestic cat one of the single greatest human-linked threats to wildlife in the country. Peter Marra, a member of AAAS, and Scott Loss, both of the Smithsonian Conservation Biology Institute, and Tom Will of the U.S. Fish and Wildlife Service estimate that free-ranging domestic cats kill 1.4 - 3.7 billion birds and 6.9-20.7 billion mammals each year. The main culprits are not free-roaming pets, but feral and unowned cats that live and hunt on the streets. The researchers estimate each of these cats kills between 23 and 46 birds a year, and between 129 and 338 small mammals. And most of the small rodents cats dispose of aren't introduced pests like Norway rats, but native species such as meadow voles, shrews, and chipmunks. This new study is a meta-analysis, a review that aggregates data from previously published studies. To arrive at the new estimates, Marra, Loss, and Will systematically sifted through every U.S.-based cat predation study they could find in the scientific literature. They carefully chose the most scientifically rigorous and reliable studies, eliminating ones in which the sample size was too small or the results too extreme. 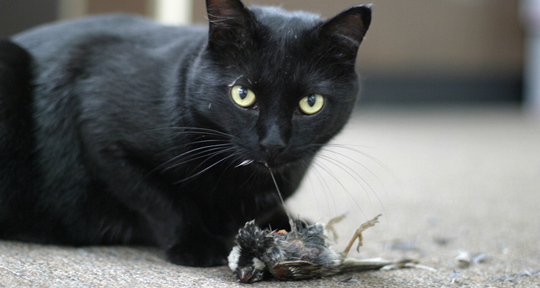 The researchers then extracted and standardized the findings from the 21 most rigorous studies, quantifying the total bird and small mammal mortality estimate due to cat predation, and further breaking the categories down into pets versus un-owned cats. The resulting estimates come with wide ranges and big uncertainties. Marra, Loss, and Will estimate that roughly 84 million owned cats live in the U.S., and that there are an additional 30-80 million un-owned cats, which includes feral cats, barnyard cats, and strays. The report has already garnered a lot of media attention and added fuel to the debate between those who view free-ranging cats as an invasive species and animal welfare advocates who are concerned for the lives of the millions of unwanted and homeless cats eking out a living or being euthanized in animal shelters. Certainly people with pet cats can take some actions; keeping your pet indoors will not only save wildlife, it can also prolong the life of your cat. Indoor cats are healthier and tend to live longer than those allowed outside. The more pressing problem is the cats who don't have homes. Tensions arise between environmentalists and animal welfare advocates when trying to decide how to manage the approximately 80 million stray and feral cats responsible for the bulk of the wildlife slaughter. The Humane Association of the United States (HSUS) released a statement after this study was published, reviewing the work they have done over the last few decades to better understand the issue of cats and wildlife. The organization believes in protecting and preserving wildlife while also treating cats humanely. According to their statement, \"The best approach involves sterilizing cats, conducting robust Trap-Neuter-Release programs, support for innovative cat programs through shelters and rescues, and educating owners on how keeping cats indoors is valuable for both cats and wildlife." What's clear is that people have made cats an invasive species, and it's up to us to take care of our pets responsibly and stop releasing cats into the wild.